When we last looked at Caustic, they were just purchased by Imagination Technologies, and their direction was unclear. At GDC last month, the remaining blurriness was cleared up, and Caustic’s latest tech was shown off. You might recall, Caustic had an FPGA based raytracing hardware setup, and when Imagination purchased them, they were on the verge of releasing an ASIC to do the same job. Unfortunately, the hardware versions of the technology are dead, but the software versions live on. Luckily, the software variants are really quite useful, and can make the life of a 3D artist quite a bit easier. One of the biggest problems with working in 3D, especially with high poly count models, complex materials, and lots of lights, is previewing the work in timeframes that don’t involve calendars. When a finished frame can take an hour or more to render, the preview button is about as useful as a divining rod and chicken entrails. Most programs simply dumb down the scene and give you an approximation, but this is hardly ideal for artists whose job it is to sweat the details. 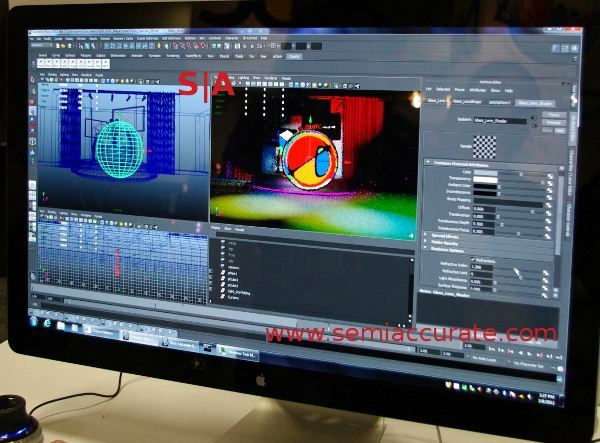 If you look at the above scene in 3DS Max 2012, you can see two copies of the scene, a normal preview and the Caustic enhanced view. Take a look at the shadows cast by the lamp and the view through the magnifying glass, which one do you prefer? Which one do you think is useful to an artist? Which one do you think is rendered with the Caustic plugin? The program was run on a dual Westmere box, and the preview was progressively rendered, basically it got better as you looked at it. Even a ‘simple’ scene like the one above took a few minutes to fill in at photo-realistic levels, but you could get a very good idea of what was going on in less than a minute. The progressive nature of the raytracing algorithm is very nice in this regard, you don’t have to wait for a finished product to get an idea of whether a tweak worked out or not, and gross errors are quick to spot. Basically, it can save a lot of time and prevent errors that you may not notice for hours, or worse yet until it is too late to change. Until much more of the animation chain is GPU renderable, this is about the best you are going to get. Things get a little more interesting moving from 3DS Max to Maya. Think about that preview that takes hours in Max and turn it in to a multiple minute animation. Can you say slow? Can you also say problems that are not apparent in one frame cropping up in frame N+329? If a preview using a full render takes only 15 min/frame, your animation will take 15 hours or so per second of animation to render out. This is not a happy place to be when you are trying to make artistic tweaks to a complex model and scene. In case you didn’t guess where this is going, Caustic also has a rendering plugin for Maya, and it uses the same progressive fill-in mechanism as the Max plugin did. As you can see in the above picture, a glass sphere in front of a colored Rubik’s Cube, you very quickly get an idea of what a scene looks like. The same dual Westmere box did the above render in a few seconds, with a very clear picture emerging in under a minute. At 1 minute per frame, the preview of a handful of frames becomes almost tolerable. Editors note: You can learn more about this type of material at AFDS 2012. More articles of this type can be found on SemiAccurate’s AFDS 2012 links page. Special for our readers if you register for AFDS 2012 and use promo code SEMI12, you get $50 off.